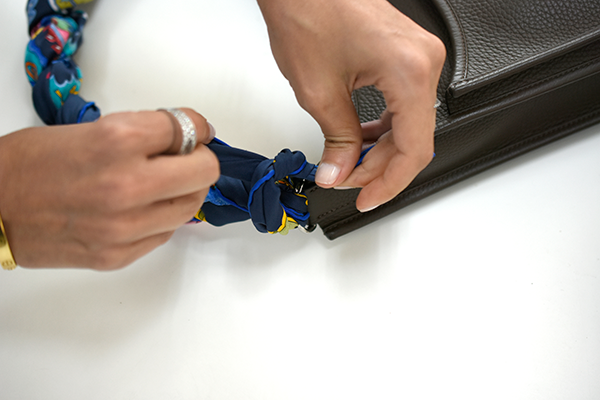 Here's the thing: A little customisation can liven up your bag and change the look completely. Recently, I found myself in a bit of a conundrum. You see, for a long time, I've always wanted to get myself one of the Motorcycle bags from Balenciaga. Then, when the First bag arrived on THE FIFTH COLLECTION, I couldn't help myself. Plus, it was going for a steal, if I can say so myself. However, while I really loved the bag, I felt the strap was pretty short - I prefer to carry my bags as a crossbody. I was going to give up the thought of buying it until one of the girls suggested that I lengthen the strap with a scarf. I was indeed intrigued. How does one lengthen the strap with a scarf? Next thing I know, I'm scouring the site for a Twilly scarf from Hermès on the site - at SGD170, the Twilly is definitely a must-buy. Our curator, Angie, assisted me with the process. Check out the pictures below. Make sure the scarf hangs at equal length on both sides, with the metal hoop resting at the centre of the Twilly. 2. Loop one end through the metal hoop on the side of the bag. But if you prefer something longer, try this instead. 1. Get a longer scarf and fold it small length-wise. You can do the same to a Hermès bag, like how we've done to the Evelyne bag. Do a thicker knot on the hardware to make it more secure. 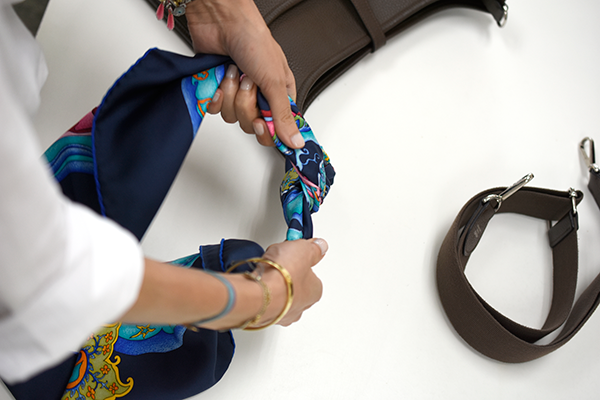 Braid the scarf, and tie the end to the other hardware on the bag. Try them on your own bag, and let us know which one you prefer! Got other chic ways of extending your bag strap, or giving it a new look? Let us know in the comments below!